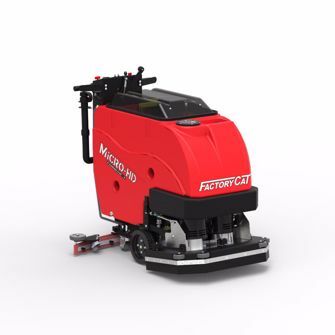 With its smart design, durability, and unmatched value, the FactoryCat MICRO-HD Walk Behind Floor Scrubber is ideal for a range of applications. Available with a Disc or Cylindrical scrub head and a range of 17”- 26” wide cleaning path, the MICRO-HD combines function and versatility. Automotive, fabrication, and machine shops, warehouses, food packaging, beverage distribution, and more can benefit from this maneuverable, compact machine. Designed with simplicity in mind, the MICRO-HD is easy to maintain and operate. Tool-less maintenance of the squeegee blade, an easy front fill system, and universal icons on the machine control panel that uses off-the-shelf toggle and marine duty switches are some of the MICRO-HD Floor Scrubber’s operator friendly features. Its ability to consistently operate at a low 72 dB is attributed to the vacuum muffler on the MICRO-HD. For ease of maintenance, a tip back “Clam Shell” design allows for easy access to batteries, scrub motors, solution filter, vacuum filter, and the recovery tank. The solution tank includes a stainless steel screen to protect your scrubber from damage that can be caused by foreign debris in the tank. Factory Cat is known for its quality American-made construction that can perform in the toughest environments. Powder-coated steel guards protect the scrub deck of the MICRO-HD and large polyurethane rollers prevent marking walls while operating this equipment. This compact, industrial quality machine can easily clean over 12,000 sq. ft. per hour. Maneuver in tight spaces with superior cleaning power using this easily maintained machine.